I learned about this golf course on one of the episodes of The Apprentice and thought this has got to be one of those course where I have to play once before I die. The others would be the St. Andrews Old Course in Scotland and the Augusta in Georgia, USA, just to name a few. I remembered when I was wow-ed the first time I played in Ria Bintan as the ocean view backdrop was breathtaking. 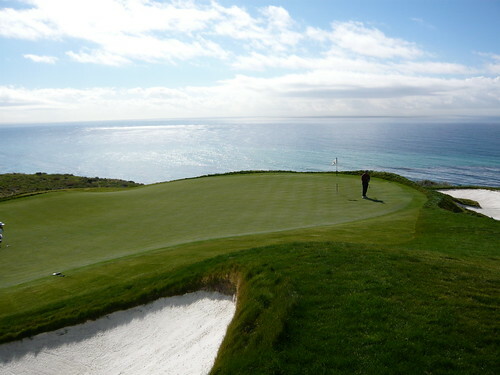 Then I up the ante when I played in Pebble Beach back in July 2004. Just when I thought it couldn't get better than that, I present to you the The Trump National Golf Club, Los Angeles. 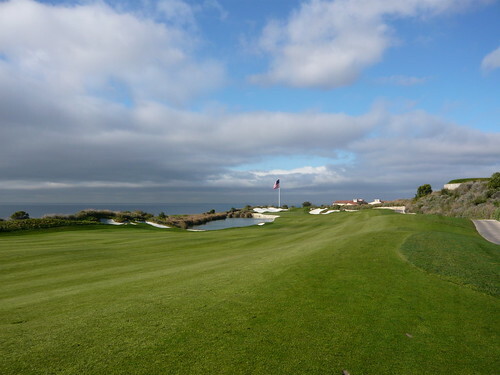 At USD 375.00, the green fee is a sliver cheaper than the USD 420 (and a 1 year waiting list) at the Pebble Beach. As prestigious as the Pebble Beach was, I felt that I had a better deal at Trump as the scenery was way better than that at Pebble Beach. It was a perfect day for golf at sub-10 degrees Celsius temperature when we teed off from First and gradually climbing up to a more comfortable 12 degrees as we progressed into the day. Perhaps due to the chilly weather, there weren't many golfers out on the course (probably due to the price too) and what we had was a quiet game among the three of us at our own leisurely pace. I shot a comfortable 91, solely on irons with the occasional 5-wood. Click here to view the rest of the photo set. Do enlarge to the maximum of the picture where the ducks were all over the white tee! Posh: Good thing I was using my Lumix. Had it been a say, Casio Exilim, it would have done the pictures grave injustice.